On August 28th, Wellworth opened up on the top floor of The 428, Minnesota’s first WELL Gold Certified Building. Wellworth is a new state-of-the-arc co-working space in St. Paul. Co-working is a place where people can work and innovate in a lively environment around other people. Their goal for Wellworth is to become a community where people are innovative and productive by being around other individuals/business professionals in an energized environment where they can get their work done. Community Manager, Rena Rasmussen, is a big part of Wellworth. She is the staff who is here to help with first level support, solutions, a concierge, an encourager, and everyone’s cheerleader. Rena has a crucial role in developing the community of Wellworth, setting events up, and helping small business start-ups. 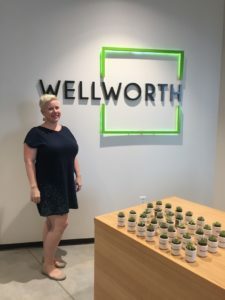 She says that people should come see Wellworth in person because that is the best way to truly understand how valuable this space is for people. Rena’s happy to give tours and teach people more about the benefits of co-working at Wellworth. Her goal is to cultivate an environment built on community networking, productivity, and wellness. Wellworth offers a variety of amenities that are aimed to help people be even more effective in their work. By getting a membership at Wellworth you get access to the café, sit-and-stand desks, conference rooms, Wi-Fi, private phone booths, natural light, filtered water, and a beautiful outdoor patio space where the walls can actually open up. By getting a Wellworth membership, you can get a day pass, five day pass, open space pass, dedicated desk pass, and private office pass. Each have their own benefits made to help different people who use the space for what suits their needs. Building owner, Pat Wolf, manages The 428. She is deeply connected to St. Paul and created The 428 with the wellness of the tenants and members in mind while deciding how best to utilize the space. As they were designing the building they had decided that Wellworth would be the best choice for the glass encased roof space. The key word is COMMUNITY. Wellworth’s goal is to be a workspace where people can take advantage of the new space with top-notch technology surrounded by other people, become more efficient in their work. It’s perfect for those who work at home alone, who want to off-site meetings, and be in a positive place that will become “their place”.